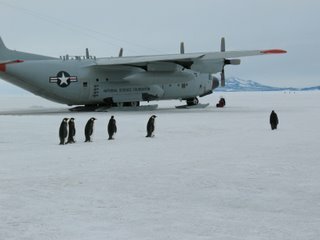 Yesterday six emperor penguins decided to walk on through the airfield on their way to who knows where. I saw them. I did not get as close as this shuttle driver did who got this picture. These emperor penguins get big. They are 3 foot high, plus. Someone remarked that they are like small humans. My flight to Taylor Dome is set for 7:15 AM (McMurdo Local Time which is +18 hours Eastern Time) again in a Twin Otter skiplane. I expect to be back Wednesday or Thursday. It may be longer if weather gets bad. I plan on sleeping outside in a tent. I have to install a few radios and a special GPS unit. Other than that I will be messing with the ham radios and helping out with whatever needs to be done at the camp. Expect some good pictures on my return.